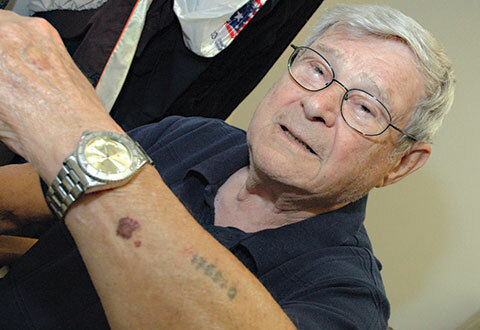 Paul Argiewicz proudly shows off his Auschwitz tattoo which is his best proof he is a holocaust survivor. But it’s the details of his story that are suspect, as is true of all ‘surlievor’ stories. THERE HAS NEVER BEEN a survivor story that passes the test of truth and accuracy – not one! Isn’t that amazing? They are all filled with exaggerations and downright lies. And that really tells us something, because “the Holocaust” is in actuality nothing more than a collection of survivor stories. I am not an expert in revisionist historiography, but I think I can say with confidence that no scientific/forensic evidentiary support for a “Holocaust” exists. Documentary support is both sparse and dependent on questionable or uncertain interpretations. That leaves us with witness accounts from those who were in the concentration and work camps to tell us what “the Holocaust” was. It’s been known for a long time that eye-witnesses are the least reliable evidence for what really happened in any given situation. Forensic evidence is the best, and even circumstantial evidence is superior to eye-witnesses. The stories that were told by false eye-witnesses in 1945-46 were outlandish compared to what we believe today. Far-fetched and grotesque accusations of sadistic methods of killing were made against camp authorities and guards and then soberly reported in the world’s news outlets. The remaining leaders of National-Socialist Germany were executed by hanging after being found guilty by an unlawful tribunal of war victors without so much as a peep heard against it in the mainstream media of the time. With the help of the Internet and revisionist historians, we have come a long way since then in using our critical judgment when it comes to blatant atrocity propaganda. Now I think it’s time to encourage even more and tougher critical thinking about the stories survivors have told and are still telling. There are certain elements all the stories have – that’s why they’re a genre. They’re almost all written by Jews. They describe awful conditions in the camps with more generalization than specifics, ie. barracks, food, work, supervision, guards and, of course, Dr. Mengele if they were at Auschwitz-Birkenau. One common observation made by those who arrived by train at Birkenau is that they saw in the distance smoke and flames coming out of the crematorium chimney. Sometimes there was a bad odor. It is known by people educated in these matters that cremation does not create smoke or odor, and that flames cannot leap out of a chimney unless it is dangerously malfunctioning. But enjoinders to stop contradicting the laws of nature and science make no impression on these story-tellers. They are following a higher law of “Never Again,” which makes lying permissible and the impossible possible. I’ve come up with the word ‘surlievor’ for them, which I’ll use from here on. With this introduction in mind, let’s look at Paul Argiewicz’ story again. I wrote about this man last week and tried to stress two major points: his lies about his birth date and about being in the Famous Buchenwald Lieberation Photo. But when I read fully through the Oral History he did with the Wisconsin Veteran’s History Museum, I discovered a few more major problems in his story. Using the critical method on Paul’s Story will show us why all surlievor stories are just that — stories so fictionalized that they are totally unreliable as history. They are meant to propagandize, and they do, but for most who read them, they also serve as entertainment in the widest sense. If you read the above-mentioned oral history interview and then read Paul’s obituary placed in his hometown newspaper you find some very different facts in the places where it counts most. For more than a decade before his death at age 88, Argiewicz was known as a regular out-patient at the veterans hospital near where he lived. The personnel there, along with the U.S. Social Security Agency, the Veteran’s Administration, and other agencies he dealt with, had his correct date of birth. That’s why his obituary gives it correctly as 1925. Then there’s a newspaper report (also here) of a 2010 presentation he made to a high school group that is different still. I have not read the biography written by Deanne Joseph, but I know that she fictionalizes his story too. I’m sure the “Oral History” from the year 2000 is more revealing than the story written by a professional writer hoping for a best-seller – or at least a good seller able to fulfill the curriculum needs at thousands of middle schools. In this interview at least, the real Paul Argiewicz does come through. Some trivia: Even though the interview took place in 2000, it was not transcribed until 2008-09. The book by Deanne Joseph also came out in 2008. Katy Marty transcribed the interview; it was corrected by Channing Welch, after which the corrected copy was typed by Katy Marty. Since the interviewer James (Jim) McIntosh and Argiewicz talked over each other fairly often, it’s evident these ladies did a commendable job. Sheryl Erdman Argiewicz, Paul’s wife, is present and says something from time to time. Right in the beginning Paul says, “Why don’t I have my wife with me?” and Mrs. A, who is apparently not seated just right next to him, says, “No just do it on your own honey.” Then she added, “I’ll just prompt you when you forget, alright?” And several times she answers questions for him. At the time of the recording, they have been married four years. Paul is 75 years old. This is important because, from what he says later in the interview, he didn’t began to speak about being a holocaust surlievor until after they married in July 1996 when he was age 71. His first wife had died and he began looking for another. He said of Sheryl, “She was available,” but not in a derogatory way. He was clearly very dependent on her. The revelation that, like so many others, he didn’t talk about the holocaust until after Schindler’s List became a big hit in 1993 and Hollywood made being a surlievor fashionable, puts the biggest question mark around Argiewicz, to my mind. Surlievor “meet groups” cropped up at that time wherever there were a lot of retired Jews. They got together and told their stories to each other, while Stephen Spielberg got the idea to tape record and archive as many surlievor stories as possible – thousands of them! [Thanks to Eric Hunt, we have been able to see a lot of them and can easily recognize the nutty things and enormous lies so many of them tell.] It sure appears it was Paul’s new wife that encouraged him to “go on the speakers circuit” as a holocaust surlievor. In fact, Sheryl’s daughter Cindy is one of the biggest boosters of her father-in-law’s story. 1. He didn’t speak publicly about being a holocaust survivor until he was in his 70’s, after remarrying in 1996. Page 56: MR. A: And we knew each other [his current wife Sheryl]. And she turned a lot in my life, a big change in my life. Literally, I couldn’t talk to you. Like you would ask me today about the interview what you give me. I would never give it to you. I would walk out. 2. Claims he was born in 1933, when his actual birth date is 1925. Page 6: MR. A: I was born in Bielsko, Poland. JIM: Boy, you better spell that one. This is pretty ridiculous because he makes himself 8 years younger when, according to his own story, he should be 5 years younger. Jim even gave him an opportunity to change it, yet Paul stuck with 1933 and his wife didn’t correct him. In a speech to a Jewish group I just happened to see on Youtube yesterday, he said: ‘In 1939 I was 10 years old,’ making his birth in 1929. So you see how it moves around. 3. Claims he was 10 years old when his family moved to the Sosnowiec ghetto, which would have been in 1943 according to the birth date he gives. And his wife answers for him. Page 8: MR. A: First I got into ghetto in Sosnowiec. MRS. A: Ten, when you went in the ghetto. MR. A: In the ghetto I was ten. Sheryl apparently didn’t trust him to tell it right, or maybe he paused. But the timing is way off , showing that they don’t seem to get it that his dates are not aligned. Nor do they consider whether one part of his story fits with another part further on. If he was born in 1933, he was 10 in 1943. The Sosnowiec ghetto was liquidated in 1943, with the inhabitants being sent to Auschwitz-Birkenau. The real Paul Argiewicz was 18 years old in 1943! 4. Claims he was only 11 years old when “arrested by the Nazis”. But what year is it? He never tells us the year, only his age. Page 9: MR. A: Okay, and we were in that ghetto for almost a year. MR. A: My whole family. The Sosnowiec ghetto was formed over time, from 1940 to 1943, with transfers of Jews from the surrounding areas. According to the Wikipedia page (which is really useless) it wasn’t “closed off” until March 10, 1943. The real Paul Argiewicz was 11 years old in 1936 – that’s a long way from living in the ghetto. One has to doubt his entire “arrest for stealing bread” story and conclude he was simply deported to Auschwitz with the rest of his family in 1943. 5. Claims he told the SS officer in charge that he was 18 and was believed. MR. A: So from the beginning you had your name and they kept your address, whatever it was. They sent me to a camp, what it was actually an “arbeitslager”, a work camp and we were working on the Autobahn. Note that in the article Robert Matzner tells of lucking out with a work assignment in a surveyor’s heated office because he could speak German, and being brought sandwiches every day by the secretary. Remember this when we get to the “sandwich” part in Paul’s story. 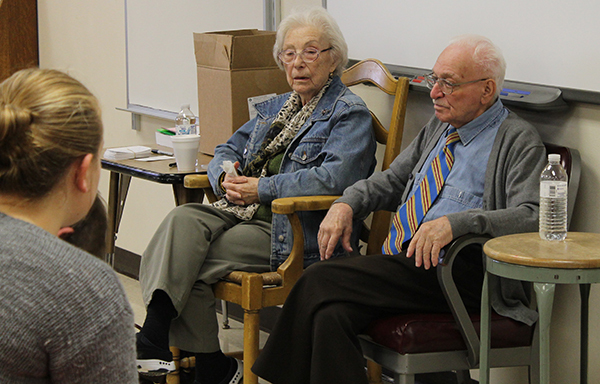 Lucy Argiewicz Matzner and Robert Matzner speaking to 8th graders at Riverview Middle School in Wisconsin about “genocide.” Robert said he spent time in six different camps, all about the same, with little food and 14 hours of hard labor a day. The work days were actually only 8-10 hours and the food was sufficient until the very end. Why do they all have to exaggerate their hardship? They’ve lived a great life ever since. Page 10: MR. A: …where I come from– It’s on the eastern part, southeastern part of Poland. […] So it was very close to Germany, and close to Czechoslovakia. That’s why I was born with three languages. I speak fluently German, Czech, and I speak Polish. MRS. A: English, of course. MR. A: And Jewish I didn’t spoke until I got in concentration camp. This is only a problem in his story in that it would have helped him get along with the Germans running the camp. He says he worked as an electrician, but just bluffed his way through. Not possible to bluff electrical work! But being multilingual enabled him to collaborate with the authorities and get cushy positions where his languages – especially German – were useful. So I’m questioning his suffering. He’s torn between representing himself as a starving laborer and bragging about how important he was. Everything he says about work is sketchy and disjointed; he avoids talking about it because he doesn’t want to be seen as a rat. That may be one reason he came up with the 11-year-old child story. I’ll add that what he calls perfect German could not have been perfect (but passable) considering how terrible his English is. 7. Claims in the camps they were fed only 1 kilo (2.2 lbs) of rye bread made with sawdust or other filler daily along with potato/vegetable “peelings” made into a watery soup. In addition, he said a bowl of ‘watery’ oatmeal was given at noon to those who worked. Page 17-18: JIM: Tell me about feeding you. How about eating. JIM: Peelings of what? Potatoes? MR. A: Carrots, cabbage, anything would work. MR. A: In a soup, cooked in a soup. JIM: Yeah, that, and bread that was your meal. MR. A: Very thin. That was main stable. MRS. A: And oatmeal, watery oatmeal in the morning. JIM: If you worked you got two. MR. A: Yeah. You got two meals. You got the bonka suppe. The “bonka suppe” that used to be … Was watered down oatmeal just like I would say a little bit thicker then that water. This doesn’t compute with what the German records show and with what many others say, but it does match what the worst of the surlievors say. Germans were not stupid enough to think starving people can make good workers. Everyone got at least two meals a day; physical laborers got four. They also were allowed to receive food packages from home and from the Red Cross and Jewish agencies. Even though Paul likes to talk about starvation, it was not happening, certainly not to him. 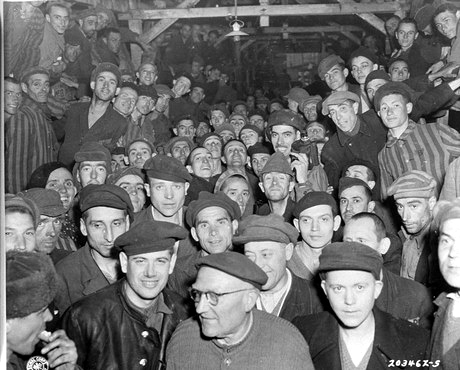 “Starving” Buchenwald prisoners at liberation. They sure look well-fed to me. 8. Couldn’t say how deep the bunk beds were in the barracks, whether 3 or 4 layers. Said he could show a picture from a magazine! Page 19: JIM: The bunks were how deep or how high? MR. A: In Buchenwald I remember, what was it, three or four I think. Was it three there or four layers? MR. A: Whatever it was. I have pictures. I bet, in fact I’d like to show you the picture from U.S. News and World Report. This is a good place to remark that there is not a single picture of our hero in any camp, or anywhere, from this period. We are taking his word that he was there. Like Wiesel, he thought to prove his claim by identifying himself in that “Famous Buchenwald Photo” but it hasn’t worked out. He’s not in it. It’s pretty funny that he can’t say immediately how many layers to the bunks in Buchenwald if he was there, as he says, for 4 months — It’s hilarious that he asks his wife — he thinks she knows more than he does! 9. Claims he worked as an electrician in the camps. How did he become an electrician? Says he was only a couple of days at Auschwitz (long enough to get a tattoo), then was moved because “I said I could work.” Says “They moved because they needed electricians.” He appears to mean going from Auschwitz to Blechhammer , not from Blechhammer to Buchenwald in Dec. ’44. I wasn’t able to find any information on quarries at Blechhammer, but we know there was a big one at Buchenwald. JIM: Outside the camp or inside? MR. A: Outside the camp and inside the factory. The factory was almost thirty square miles. Blechhammer, ooh, that was one of the biggest AEG farm industry plan. JIM: You mean continuous building, or did it just multiple buildings? MR. A: There were hundreds of buildings in all different sections. They were making out of the coal gasoline [End of tape 1, side A ca.30 min] gasoline but the factory was still in process of building it. They were not completed. Then the Americans and the British denied it to be finished, but they already produced gasoline, because this was the most important thing because out of coal you had almost a hundred different products. MR. A: Because they used to make ah, medicine out of it. They were making oil, gas, — Soap, whatever petroleum by product was producing. MR. A: How? Because I used to go with this man. Every day the guy, I used to come to him in his little cubbyhole he had. He had a few electricians with him working. He used to be the foreman and I used to be his go-fer. MR. A: No, the SS men used to bring me over to drop me off and he had to sign every day a paper. JIM: This is how far away? MR. A: Oh, I would say maybe a half a mile. MR. A: Okay. So I came there and he says, “All right.” “What I did was in the morning, used to come I put the water on so coffee and I worked with him, oh, maybe a month. He was very leery of me, very careful with me. After all, I still was a dirty Jew. This was at Buchenwald. JIM: And he was a Pole. A Pollock? MR. A: No, I wouldn’t trust him. I was, he was a real German. He was talking about Blechhammer, then the SAME STORY moves to Buchenwald. It’s totally confusing. He was never an electrician at Blechhammer if he wasn’t one when he got to Buchenwald. Says he was only a ‘helper’, a ‘go-fer’ in Buchenwald, probably because he spoke German and could work for the Germans in charge, or even Czech or Polish skilled workers. But he passes himself off as an electrician and Jim lets him do it. Another thing that comes through with Paul is that he likes and respects Germans. He obviously had a lot of interaction with them. So he blames all the bad stuff on Nazis and Austrians (says Hitler was an Austrian, not a German!). 10. Also claims he learned electrical work in Buchenwald in January-February 1945 – a wild story. MR. A: I don’t know anything, and that’s going to be the best thing. So all of a sudden he opens this little box. He gives me a sandwich. I never had a sandwich like this even when I was a kid. MR. A: So he gives me a sandwich. I ate the sandwich. He says, “Don’t ever say nothing.” A week later he came to work. Well, he comes every day, but he came with tears and crying and everything. I don’t remember his last name. I said, “Hans, mit zu Ruhe?” And all of the sudden he breaks down. He says, “I lost my mother, I lost my wife, and I lost my children in Dresden in the bombing. He said, “I have nothing. What did that animal do to us.” He didn’t say the word Hitler. This is Feb. 15, 1945. But he would never have addressed this man by his first name; plus Hans is a common German name to easily come up with. He “doesn’t remember his last name” so that he can’t be tracked in camp records and found not to exist. Most importantly, he’s making out that “good” Germans like Hans hated Hitler. And does the sandwich idea come from his brother-in-law’s story? I suspect so. MR. A: He says Was has das, no, he said “Welche art schweine mach” to us, what kind of swine, what he did to us. And I didn’t say a word to him. He became so close to me. No German at that time would have blamed Hitler for Dresden. Never. This simply didn’t take place. JIM: You were a replacement. MR. A: I was his – and when the SS men came he said, “Oh this kid? He is essential. He is such an important person. He knows everything.” And he by teaching me how to wire things and how to do things, and he says, “Certain things I used to do backwards on purpose so they would have to call you to find if there’s any troubles on the line because you know about it.” And he says, “You’ve got to be so important that they will not kill you.” And when we used to go over there when the angriffe [attack] used to be the luftangriffe [air attack], the bombing used to come, and you could hear the siren. Everybody went for the shelters. They wouldn’t let prisoners from concentration camp people in the shelters but they let me in. So he taught Paul to “wire things,” and even backwards, in one month? And this was in Feb-March 1945, after Dresden? It’s just not credible. MR. A: I had the special ribbon on my thing. MR. A: Uh huh, and I had a special instrument to save those instruments for testing. I used to carry them. He [Hans] said, “You grab those and run with them. They gonna have to let you in because these instruments are more important than you.” And that’s how I saved my life. And a lot of guys got killed. MR. A: And he used to be a foreman. He used to be a very big person at Blechhammer. And he taught me how to wire the turbines. This was got to be a perfect job. You can imagine the turbines were, each turbine was as long as this room here. In any case, never would an uneducated teenage Polish hooligan like him be allowed to work on the turbines at Blechhammer. Plus, Paul said he made his living as a steamfitter in the United States, not an electrician. Page 29: MR. A: Because when I stayed home for some reason on Saturday and Sunday we didn’t work. MR. A: Hanging, and sometime when we came from work we had to stay in crowd watching four or five people be hanged. Terrorizing people, keep them for no reason. For nothing. MR. A: Just for entertainment, yeah. When I used to come in through the doors and I could hear the music playing, they had a four or five guys’ instruments and when I heard the music playing we knew right away there would be hanging. And the worse thing one time happened to me, this I never will forget. I was already about two years in Blechhammer on Yom Kippur Eve. You see he knew about it. How did I know all these things? I worked with this guy, sometime I used to pick up an old paper what be thrown away. Shades of Elie Wiesel’s Night. I have not seen anything about public hangings at Buchenwald, but the discipline in the camp was totally under the control of the communist inmate organization, who had managed to take it over in 1943, not the SS. I would bet Argiewicz never saw a hanging in his life. He doesn’t describe anything about it – how, who, why, etc. We don’t learn “what happened to him one time.” He started talking about the Voelkischer Beobachter and Julius Streicher instead, and Jim never brought him back to it. There is a story of cannibalism at Bergen-Belson; I don’t know how true it is. It comes from a General quoting a medical officer. MR.A: On one morning I get up, I hear shoot – we were making fire and frying human bodies. Take a knife and cut off the flesh and eat it. JIM: Who was doing this? MR. A: We did, the inmates because there was no food. MR. A: Cannibals. That’s sad. So, one morning I hear shooting and trembling and I look outside and here I see a green tank with white markings, you know, olive green come right through the gate, not through the gate, through the barbed wires. And I see he stopped and I see the turret with the barrel facing one of the towers when all of the sudden a salvo I hear. The whole tower, you know can imagine, what is it? A hundred,what is it? A big barrel – I heard a salvo. JIM: Oh sure, I like that. 13. Claims he was on a four-week death march from Blechhammer to Buchenwald in November 1944. Page 38: JIM: Tell me about the death march. MR. A: When the Germans were caving in, they were losing the war in the east, and the German army already, the Russian army already entered Poland and as they were going towards Germany so they came by Kattowitz, Katowice. This was right on the German border with approximately I would say maybe sixty kilometers, seventy kilometers about 45 miles from our camp. One day they gave each one of ‘em whole loaf of bread and took us on a four week death march. When we left there were about 3,000 prisoners. By the time we got to Buchenwald there were only 800 left, maybe, and whoever couldn’t walk, they came and rolled you over with their foot, you know on your back. They shot you. That was their favorite, right here. So when they shot you they gave you instant, instant death. You didn’t even feel it, you know when you get shot right through, through the back, and that was their favorite. On January 21, 1945, 4,000 prisoners, including 150 women, were taken out of the camp and put on a death march lasting 13 days. JIM: Yeah, that’s another subject now. Let’s not get off into that. JIM: Yeah, I’m perfectly willing to listen to that. It’s just that I don’t want to get off our track here. MR. A: Because, you see when we left on the march it was in November, November, and then we got into Buchenwald, I think it was in December. JIM: You were on the road a month? MR. A: About a month, yea. All sources I find put the march from Blechhammer to Buchenwald beginning on Jan 21, 1945, lasting 13 days, half the time Paul claims. He says it was November and they arrived at Buchenwald in December 1944. Big discrepancy here. There were not two marches, only one. Why is Paul so confused? Does he want to give himself a longer stay at Buchenwald? If he didn’t arrive until February, he wouldn’t have had time to get in tight with “Hans” before the Dresden bombing. Or is he just guessing … badly. I think his entire Buchenwald story about Hans is fiction and he added it in competition with his brother-in-law whom he’s known since childhood. He was probably in Buchenwald for a couple months and it was uneventful. Page 38: MR. A: They moved because they needed electricians. JIM: So you went from one camp to the other? JIM: So you were liberated from Buchenwald. MR. A: I was liberated from Buchenwald and that was, Buchenwald was outside Weimar. Weimar, do you remember that was the capital city of the Weimar Republic? JIM: I know. Weimar Republic. Yes, I know that. The capital was Berlin, which just shows how much critical attention Jim is paying. Whatever Paul says, Jim goes along with it. And that is the reception surlievers get from everywhere since the 1990’s, and earlier. It’s been so easy for him — no matter what he says, it’s accepted, no questions asked. So why not embellish the story? Why not add a bit more zest to it, why not punish the Nazis even harder, even if they treated you decently. It needs to be done for “Never Again.” It’s the same with Robert Matzner and all the hundreds of surlievers who go on the speakers circuit and engage a ghostwriter to put their story in a book. It has to be interesting, doesn’t it? We want it to sell. It’s for a good cause — for shutting up the antisemites. The deniers. For Israel. For our children’s future and safety. For all these reasons and more, we need to keep the story going. For us on the other side, who are the victims of this hoax, we need to bring a hard critical spirit to every one of these overblown, nonsensical stories written by Jews. Not a one of them can stand up to scrutiny. (If you think one can, send it to me.) It’s just this scrutiny we don’t have enough of. Nor the media power to communicate the scrutiny we do have to large enough numbers of hoaxed and passive believers. We’ll just have to keep working at it because continuing with the status quo is not an option.